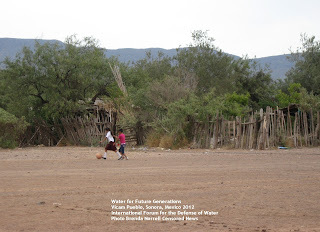 Ofelia Rivas, O'odham and representative of the National Indigenous Congress of Mexico, at the International Forum for the Defense of Water at the Yoeme (Yaqui) Vicam Pueblo in Sonora, Mexico. Hosted by the Traditional Authority of Vicam Pueblo, Nov. 20-21, 2012, the forum was in solidarity with the Zapatistas and Indigenous fighting the theft and pollution of their water. The resistance movement is to uphold Indigenous water rights and unite in the battle against corporations, governments and politicians seeking the theft of Indian water. We should all be in support of this, you have mine. Posoh!